John the apostle never ceased to marvel at the life-changing relationship he enjoyed with his Lord. It overwhelmed him to know that, at a particular time in history, the God of the universe chose to have fellowship with him, a simple fisherman. John was so overjoyed that he earnestly wanted to share his joy with others so they, too, might experience the same joy. A special fellowship or “bonding” developed between those who had personally encountered Christ as they rejoiced together at God’s goodness to them. Those around you desperately need to be encouraged by your latest encounter with Christ. 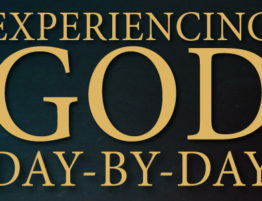 Some have lost hope that they can experience the reality of God’s presence in their lives. They don’t need your philosophies or theological speculations. They don’t need to hear your opinions on what they should do. They need to hear from someone who has just come from a personal, life-changing encounter with the living Christ. When you have had such an experience you will be like the apostle John, hardly able to contain yourself as you rush out to tell others of your amazing encounter with God. Your responsibility will not be to convince others of the reality of God, but simply to bear witness to what your Lord has said and done for you. The change in your life will be your greatest testimony of your relationship to Christ. There is nothing more appealing or convincing to a watching world than to hear the testimony of someone who has just been with Jesus.